With the South Pole facing the galactic center of the Milky Way, the southern skies provide spectacular views to the naked eye, including brilliant first-order magnitude stars – a much brighter white stripe of the Milky Way – and the majestic Large and Small Magellanic Clouds (our Milky Way’s satellite galaxies). A northern observer will see things topsy-turvy when looking at the southern skies – familiar constellations seem upside down – but getting a glimpse of Crux, the Southern Cross, which is the smallest and the most famous constellation in the southern hemisphere (it is displayed on the New Zealand, Australian, and Brazilian flags) is a thrill that reminds you how dependent we used to be on the stars to navigate our way across the world. Equally impressive is the glowing band of our own galaxy – the Milky Way – with its patches of light and dark stretching across the sky. The non-luminous part of the Milky Way is called the Great Rift (or more poetically “the Dark River”); it is made of overlapping dust clouds containing about 1 million solar masses of plasma and dust situated in the Sagittarius Arm of our galaxy at a distance of about 300 light years from Earth. 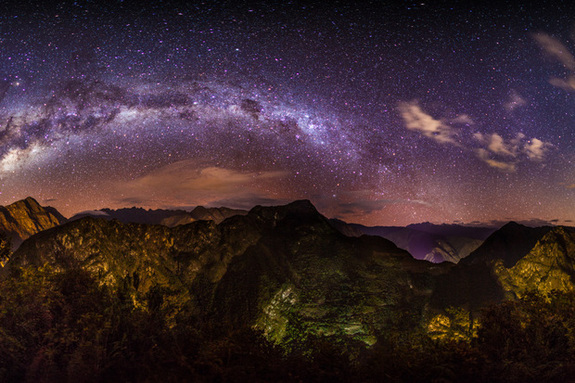 For the Incas, whose empire at its height stretched from Ecuador to Chile, “Mayu,” (the Milky Way) was a life-giving river in the heavens with its earthly counterpart – the Urubamba River in the Sacred Valley, high up in the Andes Mountains (it is now in Peru). 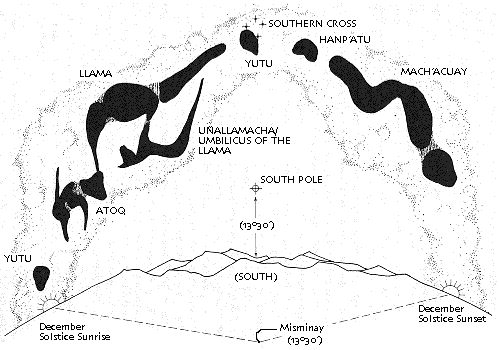 The Incas grouped constellations into two different types – luminous and dark. The first was made up of sparkling stars that depicted geometric forms in the sky. These luminous constellations were seen as inanimate. The other kind – the dark cloud constellations – were contained within the dark blotches of the Milky Way, and were considered living forms, representing animals the Incas knew. These dark patches represented the silhouettes of animals that came to drink from the waters of celestial river, obscuring the heavenly glow of Mayu.